Have you ever seen a teapot cake accompanied by a realistic looking gum paste teacup? I've seen several, and each time I find myself staring closely at the photo, trying to see if it really is made of gum paste or if it is a real cup! Surely something so realistic must be really difficult to make, right? Surprisingly it's not! 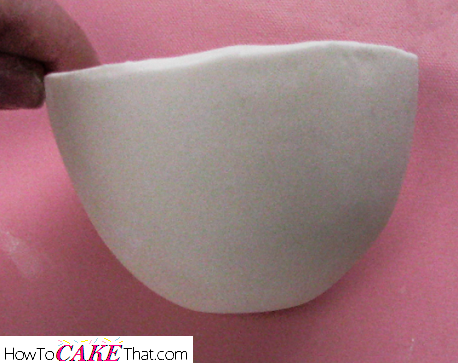 Now I know there are several tutorials out there on how to make a gumpaste or fondant teacup which require you to use a rainbow shaped template and a real cup, but my tutorial is a little different. I originally tried using a real cup, and followed along with the other tutorials, but my gum paste stuck to the inside of the cup and broke apart when I tried to remove it. So I looked around in my cake cabinets to see what I could use to make this a little easier... and I found it! 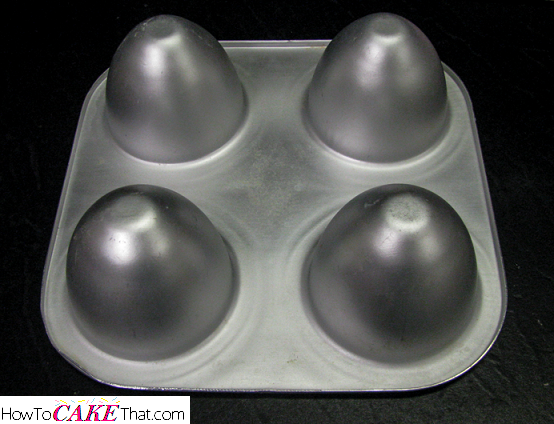 A vintage Wilton mini doll dress cake pan that my Nana gave me would work perfectly! And it did! Here it is! The Wilton doll dress pan! The secret weapon to easy edible teacups! To begin, dust your work area generously with cornstarch and roll out your gum paste large enough to cover one of the domes of the doll dress pan. 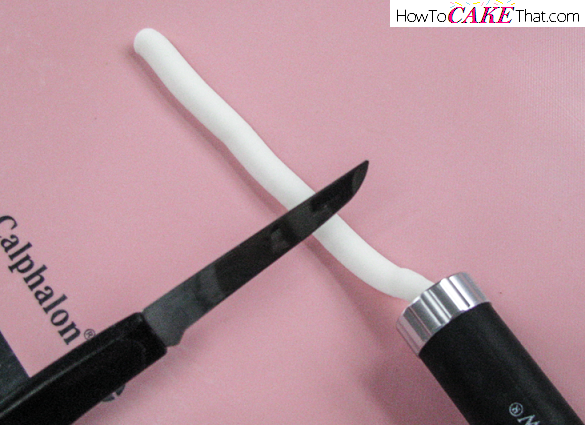 Be sure to leave your gum paste thick enough to allow for stretching and shaping so it won't tear. 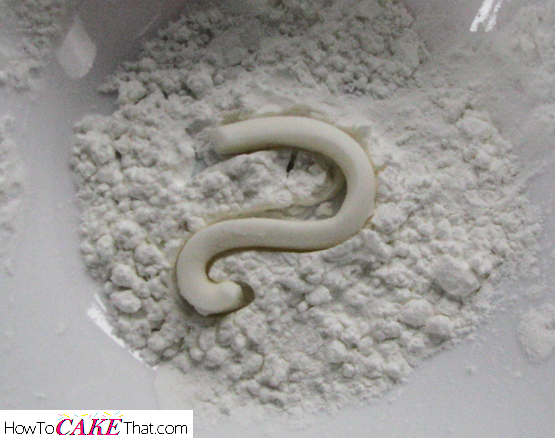 Generously dust both sides of your gum paste with cornstarch to make sure it won't stick. 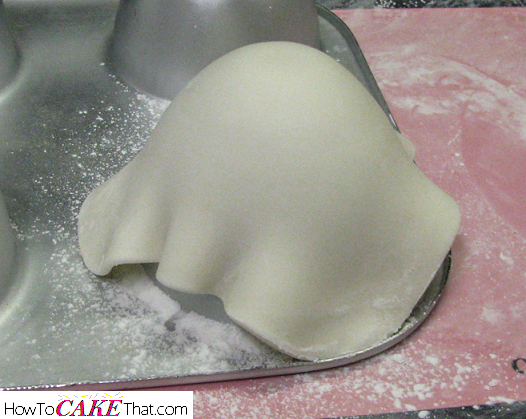 Then, gently drape your gum paste over one of the domes of the doll dress pan. 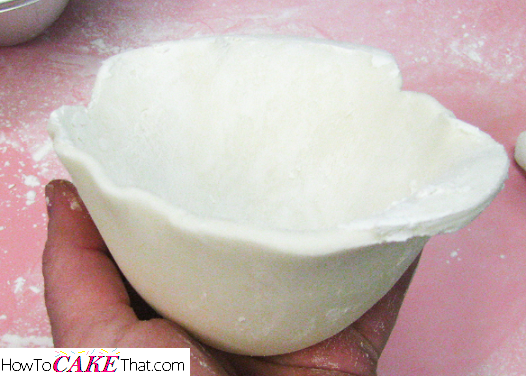 Use your hands to gently form the gum paste to the dome, giving it a smooth cup shape. 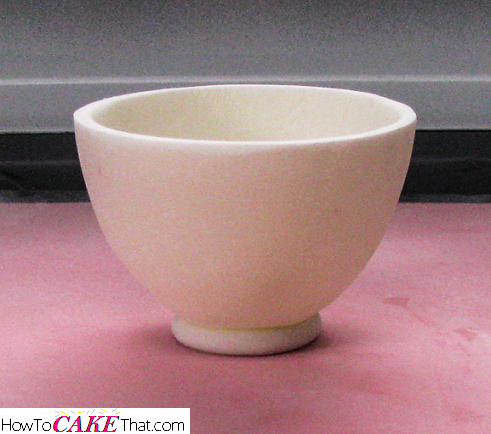 Next, generously dust the gum paste cup with cornstarch. 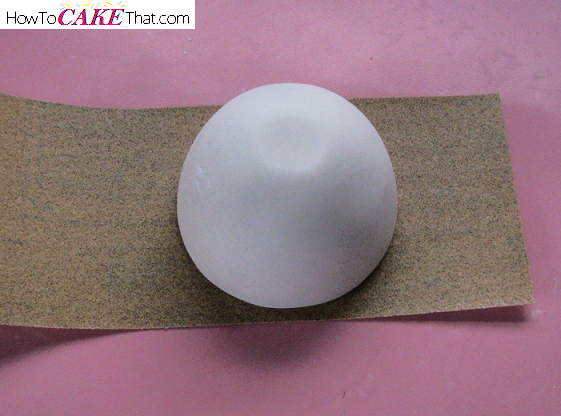 Remove the gum paste from the dome and you will have a cup form that will help when placing it inside the dome. Flip the doll dress pan over and generously dust the inside with cornstarch. 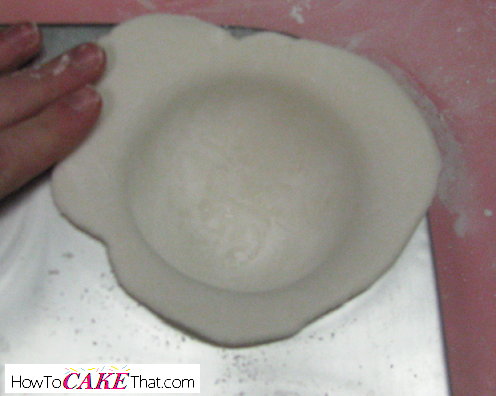 Place your gum paste cup inside the dome, and using your fingers or a large ball tool, gently press the gum paste down inside the dome to ensure the cup forms to the shape of the dome. Next, use an Xacto knife, razor blade, or scalpel to remove excess gum paste. Try to make the edge as even as possible. Allow cup to dry for several days. Next, it's time to make the handle! If you have a clay extruder, use any plate you choose to get a perfectly sized handle (I used the half circle plate). 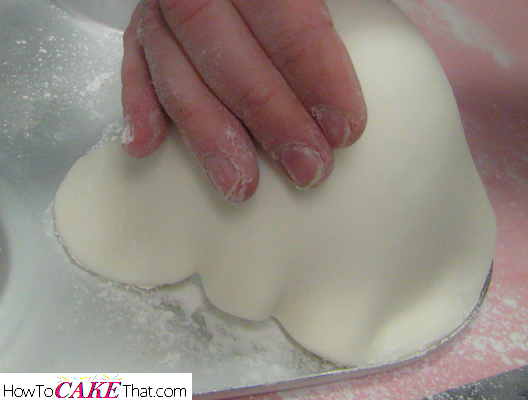 But if you do not own one, you can roll out a string of gum paste by hand, and that will work just as well. Estimate the size handle you'd need and cut and shape it. Place your teacup handle on a pillow of cornstarch and allow to dry - this may take 1 day or more depending on the humidity level in the air. To get perfectly smooth and even edges, I placed my teacup upside down onto fine 150 grit sandpaper! Gently move teacup back and forth and also in a circular motion over the sandpaper until smooth and even. *Sandpapering is totally optional. If you have a steady hand, you could use a razorblade or an Xacto knife to carve a perfect edge. Next, lightly sandpaper the inside edge of the teacup to make it slightly rounded. This will help disguise any edges that are a little thicker than others. Now it's time to make the bottom or "foot" of our teacup! 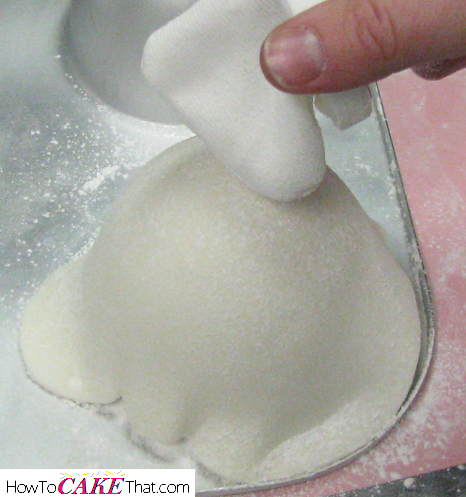 Using a clay extruder fitted with a large round plate, or roll out by hand a round string of gum paste. 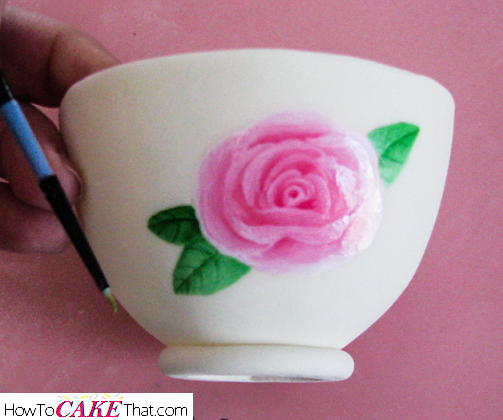 Measure and trim gum paste to fit the bottom of your teacup. 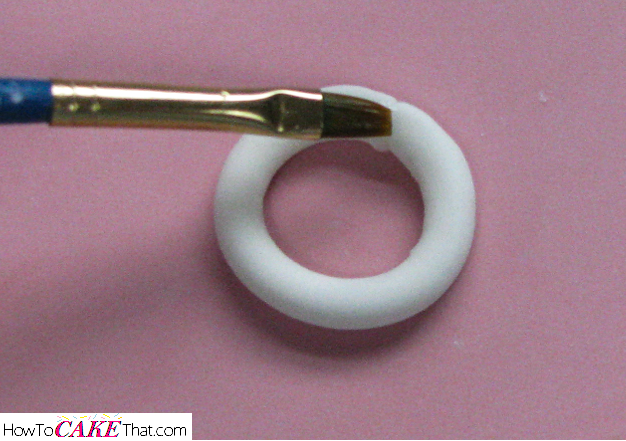 Shape the gum paste to a perfectly round ring and glue ends together by brushing with a little water. Brush inside edge as well - this will help glue the cup to this piece when we set the cup on it. Set teacup onto ring and allow to set and dry. Next, paint any design you'd like on your cup using gel food coloring and a tiny bit of alcohol. I painted my rose using Chefmaster's Gel Bakers Rose, Wilton's White-White icing color, and Wilton's Leaf Green. And I later painted the edge in Spanish Gold. Now it's time to attach the handle. 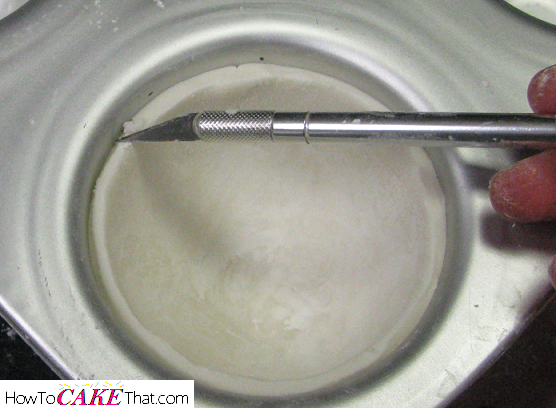 Mix a little gum paste with water to create a paste. 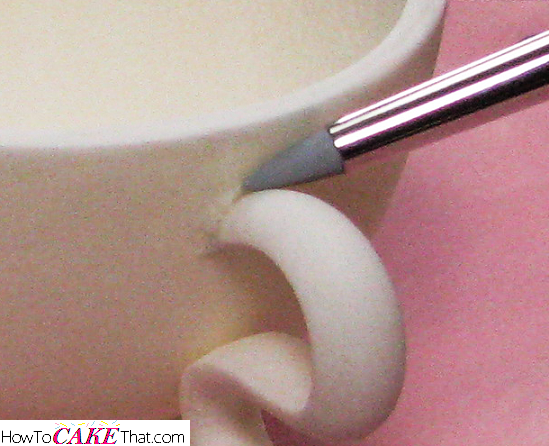 Using a dab of this paste, glue the handle onto the teacup. And that's how you make a perfect little teacup! 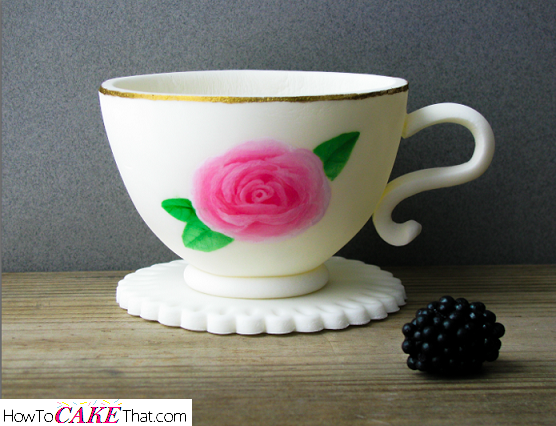 If you'd like to make the cute edible doily underneath the cup, just roll out gum paste or a fondant/gum paste mixture and cut out using a round scalloped cookie cutter. 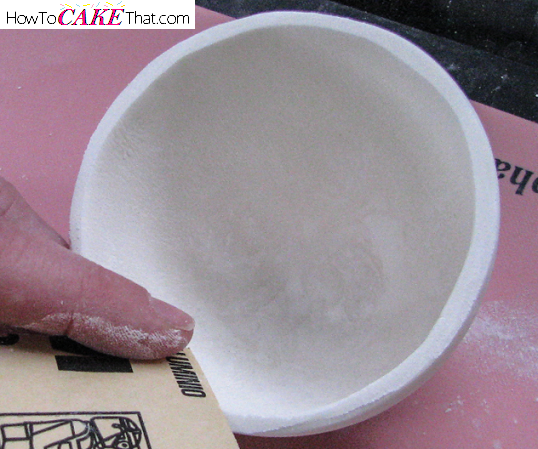 Then, make little marks around the edge using a pointed shaping tool, and allow to dry. Easy peasy! I hope you have enjoyed this tutorial! God bless!